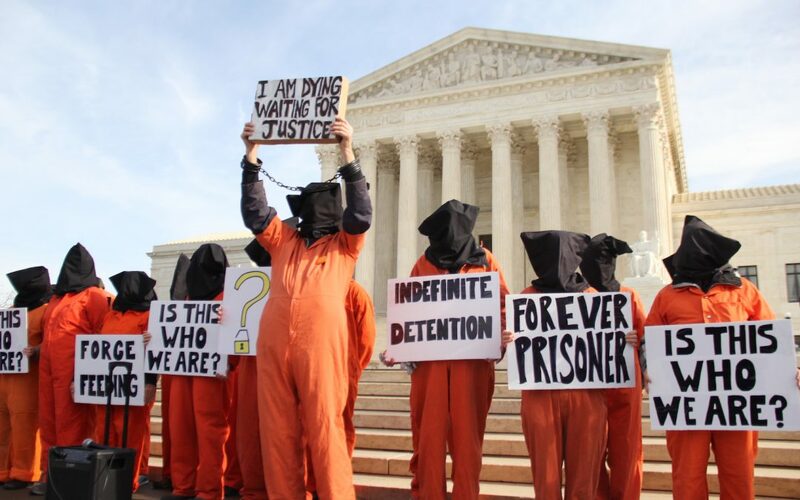 WASHINGTON – A coalition of groups protesting the existence of the detention center at Guantanamo Bay, Cuba marched from the Supreme Court to the Senate on Wednesday, demanding that President Barack Obama close the prison as one of his final acts as president. A dozen of about sixty protesters stood silently in a row wearing orange prison jump suits with black pillow cases over their heads as leaders criticized President Obama and expressed concern about the policies of President-elect Donald Trump. In 2009, President Obama signed an executive order to close the detention center, which held 59 Muslim prisoners as of last month, according to the Miami Herald. President-elect Trump has said he would keep Guantanamo open and send even more prisoners there after he takes office. Organizations participating in the Guantanamo Bay coalition included Hilal’s group; Amnesty International USA; Code Pink, a women’s human rights and peace organization; the Council on American-Islamic Relations; Veterans for Peace; and Witness Against Torture.